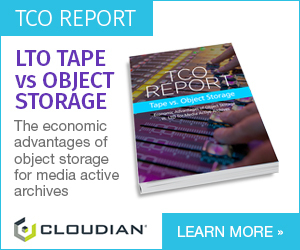 Applied Technology: Is Cloning The Backup You Need? Whatever you do in media production, having a backup is indispensable. Having another copy of the file means that in case something goes wrong, it can be restored to the last version saved without loosing all, or only a minimum, of your work. But there’s an even better practice to consider, one that provides a fail-safe in the event of a disaster. Cloning, also known as replication, offers a number of benefits outlined in this article. Cloning (or replication) is a lesser-known but more effective means of backing up files. Instead of creating a copy of individual files, it replicates a complete volume. A SAN or shared storage solution can be used as a fail-over. Simply jump into the replicated file system to retrieve what was lost. No restore is necessary. There are a multiple advantages in using replication as a ‘backup’. The first of these is that cloning is effectively a backup because it creates identical copies of all source files on the secondary storage. 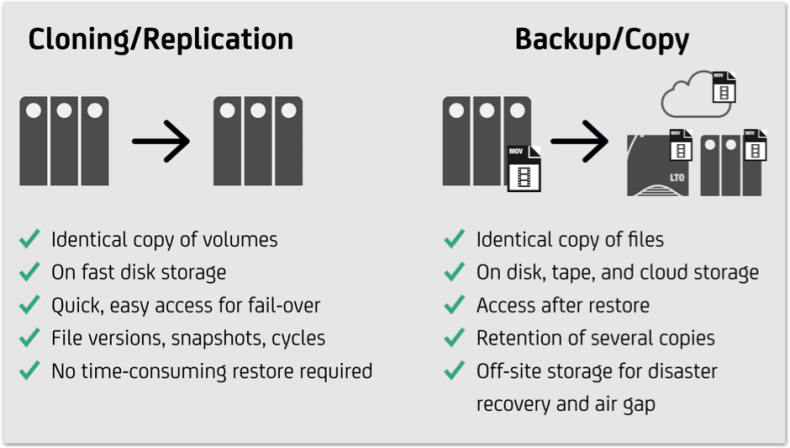 This chart explains some key differences between cloning/replication and backup. Additionally, a replication delivers not only single files, but entire volumes from the secondary storage. The volumes are easily accessible and do not need to be restored to gain access to the replicated files. Actually, cloning can be backup and fail-over in one. Depending on the setup, the replication target can serve as a complete replacement for the source storage in case the source fails. As a result, all files are immediately available in minutes, independent of storage size. The time saved in not waiting for the backups to be restored can be significant. And lastly, sophisticated software solutions offer file versions, snapshots and cycles of the source storage. This adds security as well as flexibility when files are deleted or need to be replaced for any reason. Specific stages of the source storage and its files are available if needed. A powerful multi-purpose tool for replication and data distribution can use filters as rules to select or deselect data to copy or move. Built-in support for FSEvents and iNotify saves time when large file systems are cloned because only the changed files get copied. The changed files are automatically detected by FSEvents or iNotify (depending on the operating system being used). The process of scanning a file system for changes is eradicated, and can save considerable time. One such piece of software is Archiware P5 Synchronize, which is part of the Archiware P5 suite. The software also includes the P5 Backup module, which provides the ‘classic’ data backup function, providing double indemnity against loss of work. A classic backup tool offers its own big advantage. While cloning obviously only replicates disk storage to disk storage, a good backup includes compatibility with disk, tape and cloud storage. That means you can add an extra level of security by using different storage media for your backup, while keeping one of them off-site for that much-needed air gap. When considering data security measures, spend time analyzing your specific requirements. Does the solution require quick, easy and immediate access? Or, should the backup be spread over several media, at the price of waiting for the files to restore? Once these answers are known, you are half-way towards defining a best-solution for your needs.